This is the Canadian Thanksgiving weekend, but I thought I should post my thoughts on the upcoming Lunar eclipse on Oct 18. I started a description in the Oct 6 post, which is still valid, but had a number of questions on this eclipse, which I will try and cover here. To be clear Solar eclipses are typically more powerful than Lunar eclipses, however, Lunar eclipses can have a strong effect. The first point I should make is I am NOT forecasting a definite market crash. We should be alert during the next few weeks as the potential for a negative market move is possible. Keep in mind there are also some positive cycles over the next couple of weeks which would contradict the following. What follows is some interesting Astrological similarities between the upcoming Lunar eclipse on Oct 18, 2013 and the full Moon of Oct 18, 1929. First a chart of the DJIA for the 1929-1930 period. We can see the Full Moon was at the beginning of the worst part of the fall in 1929. 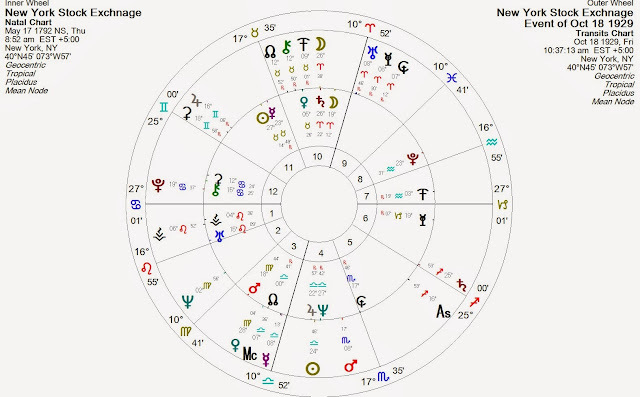 The next chart shows a dual chart of the New York Stock Exchange (inner wheel) and the transiting planets (outer wheel) as of Oct 18, 1929. A number of points worth noting. 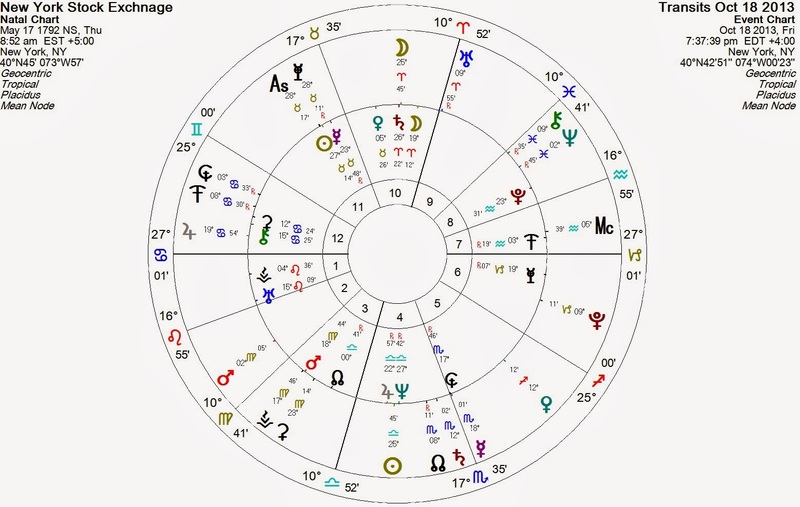 The chart in the inner wheel of the NYSE has Jupiter conjunct Neptune both opposing Saturn. Every October the Sun will transit over this point. 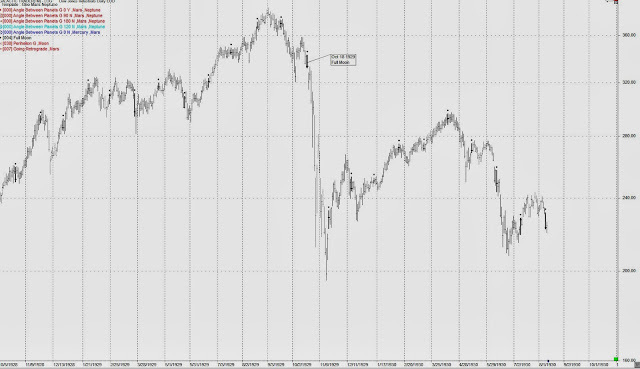 Could this be one of the causes of the stock markets negative history in the month of October? From COSI "The Combination of Stellar Influences"
"A lack of self control, irresponsibility, speculation, a squandering of physical strength. The act of deceiving or the misfortune of being deceived." "The tendency to be upset or depressed easily." " The methodical execution of plans, the slow attainment of success through intense activity and great pain-staking effort." COSI was published in 1940. Let's hope it is the latter. Saturn opposes the Jupiter Neptune conjunction. Saturn is concrete reality. Neptune on the other hand is delusion, deception and possibly involve inflation or deflation. Jupiter stands for expansion and optimism while Saturn is staid and somber. Thus there is conflict which gets emphasized when other planets transits hit these points. In this chart we also see Jupiter trine Pluto, the latter being a money planet and often other peoples money. Now look at the outer wheel which shows the transiting planets as of Oct 18, 1929. The Sun is transiting over the Jupiter / Neptune conjunction and therefore opposing Saturn thus bringing light to these energies. The Moon, is a Full Moon sitting on Saturn. The opposition in the natal chart is being lit up by the Full Moon. Also note the position of Uranus at 8 Aries 46 and retrograde. It is very close to the 2nd decante of Aries which is ruled by the Sun. Uranus is all about sudden changes and surprises. Now the same type of chart with the New York Stock Exchange in the inner wheel and the transiting planets as of October 18, 2013. A number of points worth noting. The Sun is back sitting on Jupiter / Neptune but this time it is in a more powerful Lunar eclipse with the Full Moon in fiery Aries dampened in this chart by it's transit over Saturn. Transiting Jupiter is in a wide square to the Sun. Of interest is Uranus. It is back to almost the same position at 9 Aries 55 and retrograde. Again close to the second decante of Aries. My original forecast was for the general markets to rise here into early November. It's possible the market slide could start near the upcoming Full Moon. 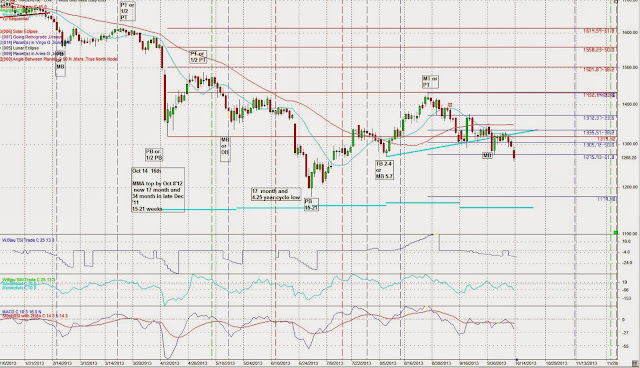 If so I will have to revisit my forecast for a down move in late Oct / early Nov. Again, this does not guarantee a crash is coming but the energies are there and it is more possible than normal. No matter what happens the next month should be unusually volatile in many markets. The Sun in waxing Square to Jupiter on Oct 12 is often is a sign of a change in trend starting approx. 1 week after the exact date of the square. Note the last post in Gold. Late Oct / early November could be significant. If going down hard a sharp reversal maybe a big surprise. Note the Oct 11 post on Gold. Manipulation is rather obvious. We are in the 16th week of the Primary cycle (nominal 18 week) which averages 15-21 weeks. We are due for a Primary cycle trough in the late Oct / early Nov time frame. A number of forecaster and cycle analysts have noted the 6 week cycle has been quite consistent in Gold. Gold may be retesting the June 28th low. You may recall I am currently looking at June 28 as the 4.25 year cycle low. If we go below that low we may be setting a new low for the 4.25 year cycle. If Gold does make a strong move I'll be watching the US$ as well.